Pat Spears: Ancestor Detector: I Need Your DNA! In the past, all that genealogists wanted from possible cousins was their family tree. But since the advent of DNA testing, made available to everyone at an affordable price thanks to companies like FamilyTreeDNA, "23 You and Me" and Ancestry, we now want suspected cousins to hand over their DNA! Genealogists welcome the opportunity to further explore ancestry that DNA testing gives us, and we have trouble understanding why everyone doesn’t jump at the chance to take advantage of this new and wonderful technology. On the other hand, we all recognize the assaults on privacy that are an everyday nuisance in our modern society. So when we cold-call a possible cousin, we have to be prepared for a cold reception. 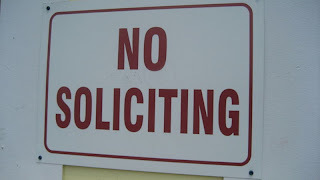 At the very least we may be seen as a solicitor, or we may be suspected of scamming or perpetrating identity theft. 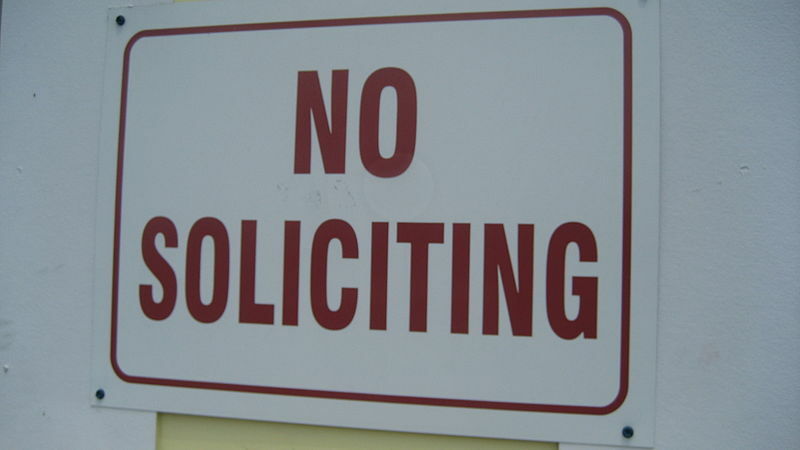 No Soliciting, 10 June 2007, Marcus Quigmire from Florida, USA, Creative Commons Attribution 2.0 Generic license. At the end of the conference, Bennett caught up with Alan and asked him if he would take a DNA test to see if they were indeed related. And very politely, Alan declined. When we brave a cold call to a possible cousin, how can we minimize the chances of having the person immediately hang up and maximize the opportunity of having a conversation? Before you can get to the point of asking someone for something, you must first give the person a reason to listen to you. I think here is where I should tell you my qualifications to be writing this guide to persuading people to share their DNA. Before I made my first call, I decided I would pay for the test if my target would agree. You may decide to negotiate when you begin “courting” a possible relation. I started with my brother, Roy Spears, about four years ago. This took a little work as my brother wasn’t sure about the privacy of DNA testing for genealogy. But when his questions were answered, he agreed to be tested. After my success with my brother, I decided to seek DNA from my paternal first cousin, with whom I had had no contact since we were children. In this instance, I needed more time to develop a relationship before I could hope to have a chance to get a “yes” to my quest. When my brother’s DNA results came back (I used FamilyTree DNA as my testing company), I had two matches: “Frederick Johnson” and “Asa (Carl) Atkins.” I didn’t realize until later that matches other than “Spears” (my birth surname) are a red flag. It wasn’t until Sallie Atkins, the wife of Carl, e-mailed me that I had a big surprise. Sallie said that she had been studying the Atkins and Johnson families for over thirty years, and she had come to the conclusion that her husband and my brother were both Johnsons! We became friends and decided to look for a living Johnson from this line so we could check his DNA against my brother and her husband. We were fortunate in that our Johnson/Atkins/Spears ancestors lived in a small town so the number of Johnsons I had to call was manageable. Actually it was the second person I called who turned out to be the one!! It took the combined efforts of Sallie and I (and two personal visits) to form a relationship with Mr. and Mrs. Johnson. But eventually he agreed to take a DNA test, and the result confirmed Sallie’s conclusion of how we were related. Both her husband and my brother (and me) are Johnsons!! From this auspicious beginning, Sallie and I have recruited more possible cousins to share their DNA with us in the cause of tracing family lines and seeking to solve puzzles that have challenged researchers for decades. So far we are at 7 successes out of 7 tries! In addition to my track record on obtaining DNA tests, my second qualification is a skill I possess. I have been told by many people that within a few minutes of meeting them, they feel comfortable talking with me. I think it safe to say that this ability is paramount to gaining a person’s trust.You may wonder if this is something you have to born with, but I believe anyone can learn to put people at ease through practice. Now let’s talk about the steps to follow in a DNA-seeking scenario. July 1990, image is in the public domain. You dial the number of a possible cousin. When the person picks up the phone, you have just a few moments to separate yourself from “nuisance” cold-callers. With a smile on your face (even though the person can’t see you, a smile affects your tone of voice and your manner in a positive way), say your name, that you are studying family history, and that the two of you may share a common ancestor. Then wait for a response. If the person seems at all interested, move to step two. This is the point where you want to show the person that you respect his/her time. Ask if this is a good time to talk. If the person says that it isn’t a good time, ask if you might call again. But if the person signals that it is okay to keep talking, then do so! It’s important to strike while the iron is hot!! ancestor chain to the great grandfather. Most people won’t know the names of their ancestors past their grandfather, but you may get lucky. Now that you have the person’s attention, you need to establish some common ground. After all, sharing an ancestor 50-100 years ago may not mean much to a non-genealogist. Before you even make the call, consider some things you might share with the person: locality in the US, job status (working or retired), field of work, children/grandchildren. Talking about these topics can help start a relationship. As you come to the end of your call, offer to send a family tree or a photo of a common ancestor. Ask if the person has any questions. Sometimes people have a family story they have heard over and over and wonder if it is true. You may not know if the story is authentic, but it gives you something to look into and raises your standing with the person. I believe that getting people to say yes to a DNA test is a lot like getting people to yes to many things in life, including coaching a little league team, attending a charity event, or agreeing to chair a church committee. In 2006, Brian Clark started a popular blog on marketing that is still going strong. Dean Rieck, a recent guest writer on Copyblogger, wrote a post called “Six Ways to Get People to Say ‘Yes’”, where he explains compliance triggers – six things you can do to get a person to comply with your request for a DNA test. One of the triggers Mr. Rieck discusses is “reciprocity”: if you do something for someone, the person feels more obligated to return the favor. So you start with offering to send some family information. Another trigger is “liking” – Mr. Rieck reminds us that people are more likely to comply with a request if they know and like you. That’s why you want to be patient in your DNA-seeking. Remember, it’s hard to turn a “no” around, so don’t ask too early. Take time to build a relationship. In conclusion, although DNA testing has changed the world of genealogy research in a dramatic way, it behooves all of us to remember that this tool doesn’t replace other research avenues (including vital records, land, census and court records.) Instead, DNA testing is one more arrow in our research quiver. Also, in order to make use of this wonderful tool, we have to learn how to persuade those who possess the DNA we need to agree to take a test.